We’re almost half-way through 2017 and I’m half-way to my 2017 reading goal. I’ve read books this year that I did not expect to read, and because of that still have a lot of anticipated books on my list. Some of these books are new and releasing in 2017, others have been on my shelf for ages and I really want to get to them soon. I mentioned this book in my January post about 2017 Series I was excited for. Back when This book has, unfortunately for my impatience, been pushed back to September 22, 2017 instead of the previously announced date of “spring”. My husband introduced me to this series and the shenanigans of Locke Lamora and his crew. These books are so much fun and this finale will be epic. I can’t wait. I really enjoyed the first book in this series (Sawbones) in 2015 when I was fortunate to read an e-galley. I’ve been waiting for the chance to read the rest of Laura Elliston’s story and am stoked that the second and third books are coming out in so close together. I’ll definitely be downloading these to read on my summer vacation. They will be fun beach reads – think historical romance, western, female doctor, on the run. So much fun here and a lot of action too. Non-fiction isn’t usually my thing, but I really enjoy Sam Maggs’ writing. She’s smart and passionate, and pretty badass. Her first book, Fangirl’s Guide to the Galaxy is all about being true to yourself and what you love and feeling comfortable going to fan conventions and celebrating the books, movies, or whatever that get girls excited. This book is informed by Sam’s graduate degree and is chock full of great research. I got it for Christmas and still haven’t read it. I must remedy that. This book has been on my Kobo for over a year! I still haven’t read it. Agatha Christie is a queen of mystery and I fully plan on reading this one soon. I’ve heard so many amazing things about this book. I’ve been slowly working my way through the Lumberjanes. These comic books are so much fun. They are quirky and weird. The girls are hilarious and brave and silly. These are probably the ultimate feel good books on my list right now. The Lumberjanes are all about friendship and girl power and finding and celebrating each girl’s strengths. 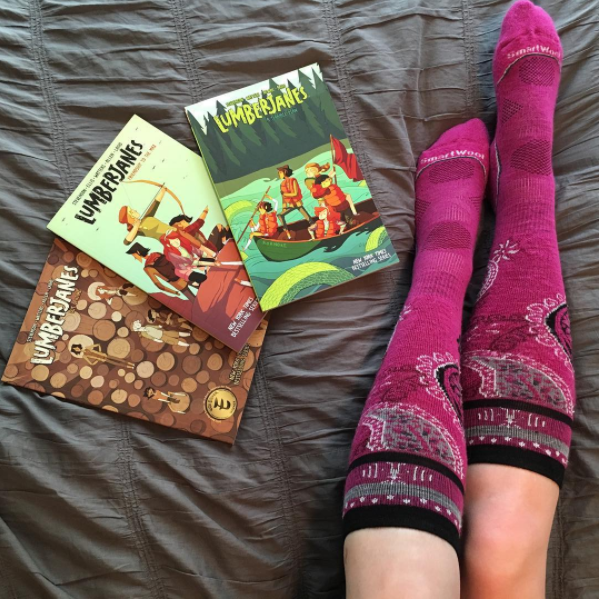 Lumberjanes sometimes feature on my Instagram! As do fun socks and other great reads! This middle grade read is the sequel to The Water and the Wild. Full of adventure, with a girl protagonist and a really interesting set-up, I’m excited to finally (months after reading the first book) continue reading about Lottie and Eliot and the strange things they encounter after climbing through the door in Lottie’s apple tree. Room is another book that has been on my TBR for years. It’s been on my Kobo for ages. I’m so intrigued to finally read this book and see the story from the perspective of a little boy who sees the room he and his mom live in as a big wide world. I purposely avoided the movie too, because I wanted to read the book first. Perhaps I’ll read this on my trip this summer too. After reading Dumplin’ by Julie Murphy, I know I must read everything she has written. I love her style and her passion and her humour. These are her other books (a bonus for you since I’ve now listed 11 books! )–Side Effects is actually her first book (published in 2014) and Ramona Blue is her newest (published May 2017). Okay! That’s some of what I’m excited to read. It’s a pretty random collection and I really like that. I like mixing up genres and styles to keep things fresh. What about you? What books are you excited to read this year? I’ve had ROOM for years as well and still haven’t gotten around to reading it. Not sure why since it’s supposed to be excellent. I love AND THEN THERE WERE NONE. It’s a classic!